Jim Johnson, Standish Group, wrote the book ‘The good Sponsor’. The Standish Group already published The Executive Sponsor Research Report. And this book can be seen as a follow up and will help you to strengthen your skills to be a good project sponsor. The main part of the book is built around 10 major attribute/skill areas and provides insights and best practises to become a good sponsor. The last part of the book includes a summary, the history of the research and appendices talking about 21 perils of using consultants (Why not write a book about this Jim?) and a story on project saboteurs with a reference to the book The Project Saboteur. The author sees the sponsor as a Clipper ship captain with skills like inspiration, hard work, imagination and fast decision making and many more. Compare Captain Richard Woodget of the Cutty Sark. As a reference point for an excellent project sponsor we see the ideal captain. This ideal captain is positioned in the middle of the Captain Scale with five different functionalities (see the QRC picture with the Captain Scale/ Inspirational personality spectrum). In this Captain Scale we see at both ends the poor-quality project sponsors: Mother hen and Deadbeat dad and in between the Nitpicker and Drifter. Every skill has its own chapter and you get a deep dive into the skill and a decomposition in competences. E.g. perspiration includes commitment, optimization and sponsor bonds. For this specific bonding competency, a separate appendix gives you 25 questions to ask project managers to promote bonding. Besides the detailed explanation including many best practises, examples of good and bad sponsors, and examples how to improve executive sponsor skills, you will get some additional material like a related book that you might consider to read including a one-page summary, a quiz to test the specific skill based on the judgement of every competence (very skilled, skilled, moderately skilled and poorly skilled) and the fit on the inspirational personality spectrum for this skill. Every chapter ends with four exercises to improve the discussed skill. Conclusion: definitely worthwhile to read if you are in the position of project sponsor and want to improve your own sponsor skills. I will include the outcome of this book in my own project board / sponsor awareness workshops. The Chaos Group offers a project executive sponsorship Self-testing kit. The kit includes an assessment and benchmark as well as a calculation tool to estimate the time you will need to spend on the project to make it successful. See: www.standishgroup.com/goodsponsor. The Effective Project board. Keeping projects and programmes on target written by Jan Postema. This book is divided in two parts. The first part is about the theory behind project boards (project governance, strategy alignment, project manager world, project boards and project success and roles and responsibilities) and the second part describes the practical implementation of the project board (how to secure a project and how to prepare your organisation). As a red thread throughout the book you will find a case about a quality management system implementation project. In the first part we see how they started and operated as board members and in the second part what needs to be changed, in the project board, to make it a success. As I am running, from time to time, what I call project board awareness workshops, related project board books always have my special attention. After reading this book I will add some topics to my workshops. E.g. the introspective questions to check if I am eligible for a project board as well as the usage of the eligibility chart. Thanks for that. The second chapter positions projects in an organization. Projects need to serve a strategic goal, are aligned with the strategy and are intertwined with the organization. From that perspective the project governance needs to fit within the wider governance framework (Relationships, change, people, finance, viability and sustainability). Chapter three puts the project board in the spotlights. Project boards embody management support. The Standish Group, as well as many other research put top management support as the number 1 for project success. A Project board bridges the gap between change and business as usual and are the extension of the organisation’s governance. The chapter gives a list of several sources of dissatisfaction with project boards. The author also gives an explanation of Best Value Procurement (BVP) and the consequences for the project board. If you look at the performance (low, high) and perceived competition (low, high) you can see four procurement methods: Price-Based (low, high), Best-Value (high, high), Negotiated Bid (high, low) and Unstable (low, low). The next chapter shows that project boards bridge different worlds. Functional versus matrix, formal and informal, hybrid, and managers with different objectives. The project board manager (authority, interlocutor) and project manager (expert, aide-de-camp) must have a clear view on each other’s role perceptions (acceptance, commitment, service provisioning, trust). Chapter five explains how project boards relate to project success by explaining their functions. The author gives and explains several pitfalls for project boards (indecisiveness, micro managing, lack of trust, too much trust, …). The chapter ends with an overview of different types of project boards (Advisory board, Counselling board, Sounding board, Interest group and Project board) by looking at configuration, responsibility, authority, organisation and decision process. The last chapter of part I looks at a few roles with many responsibilities within the project board. The project board’s functions are direction setting, rationing, structuring & staffing and advising & auditing. The author follows PRINCE2 by explaining three kinds of board members: executive, senior user and senior supplier. The project manager is not part of the project board. The author sees the sponsor not as a separate role but as a needed quality of all board members and gives an overview of the sponsor’s responsibilities. Tensions in the project board are probably the most conspicuous. Sources of tension are organizing principles, employee identification, access to resources, organizational size and complexity, external pressure, relationships and tasks or processes. Chapter 7 describes the first step to get the project back on track. It starts with a board decision tree to decide what type of project board you need. As a next step you need to understand if the right project board members have been selected. A nice tool is the eligibility chart based on Bourne’s Stakeholder cycle. In this tool you score for each project board member the following items: proximity, urgency, power, direction of influence, interest and support. The total score gives you the eligibility. In the appendix you get the complete eligibility chart including the individual score descriptions. And be aware, a project board must be there from the start, it can’t jump onto a moving train. Chapter 8 focusses on the second step: prepare the ground. Make your organization ready to work with project boards. You get some rules of thumb for initiating a project board, principles for the composition of a project board and a very simple tool to access if an individual candidate project board member is eligible to join a project board based on a decision tree with introspective questions. When project boards are up and running, measure their project board’s performance. The book ends with an epilogue summarizing the four aids starting with the rules of thumb, then looking into the principles and introspective questions and finally the eligibility chart. The book is definitely worth reading, gave me some new helpful insights and as stated I will use some during my project board awareness workshops. For a next print I would suggest to include explanations for the figures used. Some are self explanatory but not all. Being the project sponsor a practical guide for executives by Ten Gevers and Bart Hoitink. De stuurgroep aan het roer by Ir. Eugene Penders, Drs. Arjan Jonker, Drs. Ing. Gerard Meijer en Prof. Dr. Ir. Fred Heemstra. Effectief sturing geven aan projecten by Lia de Zoete en Reinier de Koning. PMI just published the second edition of Project sponsorship, achieving management commitment for project success by Randall Englund and Alfonso Bucero. This book is, in my opinion, a thorough guide to educate stakeholders on the nature of project sponsorship. If we listen to Gartner, Standish, McKinsey and many more one of the key factors for successful projects is commitment of your sponsor. The authors give you many ingredients to make project sponsorship a success. The book is divided in ten chapters focussing on different aspects of project sponsorship and has an extensive appendix with lots of checklists and questionnaires. Every chapter contains one or more case studies to clarify what is discussed. The first chapter defines sponsor responsibilities, which are needed to make the project a success by creating the right environment for the project manager to be successful. In the appendix you can find several views on different roles and a set of questions regarding client-based sponsorship. The second chapter focuses on the establishment of project sponsorship and shows what it means for different types of organizations in terms of maturity and culture. To establish effective project sponsors takes time. In the appendix you will find a sponsor influence assessment questionnaire. The next chapter describes how to sustain sponsorship. Without a strong commitment from the sponsor to improve, the sponsor will not survive. And without the help of project managers in getting sponsors to fulfil there role as sponsors it will be difficult. The appendix gives a quality review process chart, a sponsor reviewer set of questions and an overview of characteristics of strong sponsorship. The fourth chapter is about building and sustaining relationships between sponsor and project manager, clients and providers and the more specific the sponsor role in this relationship building. Chapter five emphasises on business teams. Business teams are steering committees, project or programme boards. These teams are there to direct and not manage the project. For me this is the weakest chapter of the book. Directing a project and managing a project portfolio are different things and ask for different decision making bodies. In my opinion the authors don’t make the difference. Also I have my doubts if you have to add all main project stakeholders in the project board. I would say all major stakeholder interest must be safeguarded in the board but don’t make the board too big. This will have a negative impact on the speed of decision-making. The next two chapters focus on evaluation the sponsorship culture and coaching and feedback. In the appendix you get a sponsor evaluation tool a sponsor risk assessment survey and feedback questionnaire, assessment tool and action plan. Chapter eight is about developing sponsors by creating specific training or awareness workshops and the role of a PMO in this. In the appendix you can find a sponsorship development memo of understanding. Chapter nine describes the benefits of sharing knowledge, the added value of mentoring and lessons learned from regular reviews. The last chapter talks about leading the way to achieve results in a political environment. What does it mean if you have to lead with (personal) power? How will your political plan looks like if you want to achieve results? Who are your comrades, allies, adversaries and opponents? In the appendix you find a sample political plan. This book is a must read for project sponsors. It will definitely help you to get a much better idea of the role of the project sponsor and what you can, or have to do, to make your project a success. Michiel van der Molen sent me his new book ‘Successful Project Sponsorship. A time-saver for the busy executive’. Finally I would say. I used to give his Dutch book as background information to participants of my workshops about directing projects or project sponsorship. But when it was a non-Dutch speaking group I had to say: ‘at this moment there is no corresponding English book’. Now the book is there, I can say it was worthwhile to wait. The result is, as I would expect from Michiel, a great book, easy to read and really practical. Being involved (reviewing, advising) with several versions of his Dutch book about sponsorship (it’s now the fifth version) I can see the evolution of the book. The first versions were focusing on PRINCE2 for executives, the fifth version was more generic but uses the terminology of PRINCE2 and ISO21500 and this English version was rewritten using the PMBoK terminology but keeping the good things of PRINCE2 like the business case, senior user and senior supplier roles, management stages, tolerances, management by exception etc. This doesn’t mean the book is only useful for PMBoK users. On the contrary, this book is suitable for all involved in directing projects, independently of the project management method being used. This book is divided into three parts and a set of appendices. The first part covers the four principles of successful project sponsorship and the second part goes into some details and gives advice in the areas of the roles within the steering committee, how to direct a project manager, how to realize benefits, achieving quality, uncertainties and some more. On many places you will get tips for agile projects and tips for the PRINCE2 environment. These two parts forms the heart of the book and are in line with the fifth version of the corresponding Dutch book. The four principles are key if you want to be a successful sponsor of a project. In the attached figure (download: 4 principles) you see the four principles for successful ownership, what they provide, offer or contribute to and some advises. Two principles are business related and two project related. The third part of this book: ‘Advancing project sponsorship in organizations’ as well as the appendices are completely new in relation to the Dutch fifth version. The third part will help you to introduce, embed and improve project sponsorship in your own organization. Why is it so difficult, what challenges do you have to overcome? What approach can you use and what type of training courses and workshops can you develop/offer in project sponsorship advancement programmes. In the appendices you get overviews from PMBoK, PRINCE2 and Agile and an overview of the main responsibilities and accountabilities related to the direction of projects and divided across the project manager, senior supplier, senior user and project sponsor. 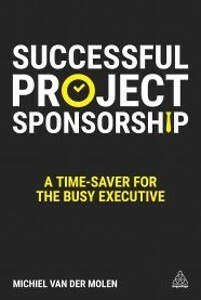 Conclusion: If you are looking for a practical English book on project sponsorship this is a must have. I am going to use this book in my workshops for project board members and sponsors. If I look at the draft ISO21505 standard on Project, Programme and Portfolio Management – Guidance on Governance, I get an overview of the responsibilities of the project governance body and as far as I can see this book is in line with this draft standard. The Project Success Scan showed that in 65% of the recorded projects, there is no support or active promotion by top management. See related posts. A recent report “Executive sponsor engagement, top driver of project and programme success” from PMI and BCG uncovers three primary factors that can limit or inhibit sponsors’ ability to be effective: an organizational culture that leads to sponsors being overextended; inefficient communication; and lack of professional development of sponsors. 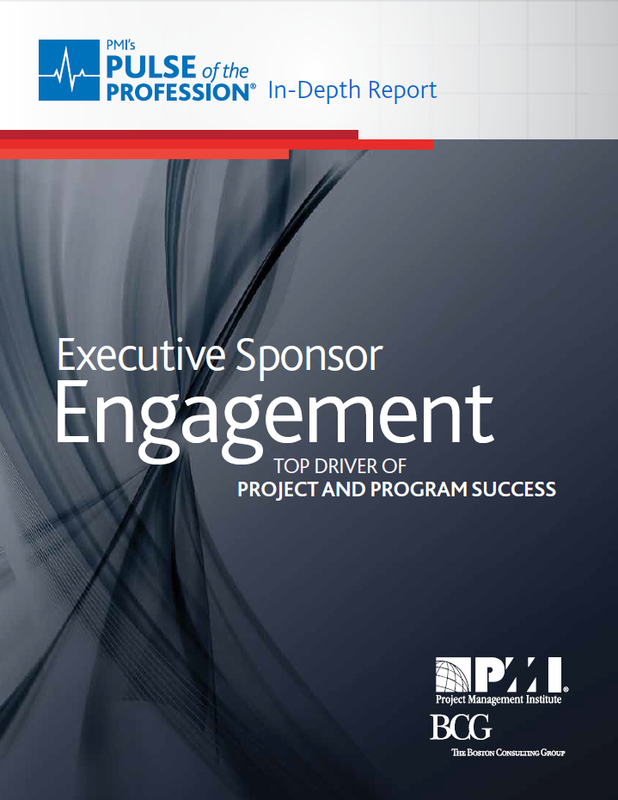 This PMI’s Pulse of the Profession In-Depth Report addresses these factors and used feedback from 897 project management professionals and 232 project executive sponsors. Definitely a must read for project executives and project / programme managers.